For jaw-dropping surprise, it doesn�t get any better than Kim Davenport�s doubling of the corner-pocket points in the final of the 1989 Coors Valley Forge 9-Ball Classic in King of Prussia, Pa. The shot came in the midst of a nearly perfect performance by Allen Hopkins, who led, 9-4, at the time. Hopkins flummoxed Davenport throughout the match with devious safeties, and Davenport constantly found himself in difficult positions when he could get to the table at all. In the 14th game, Hopkins dropped Davenport into the tight spot diagrammed here, with no chance at a conventional kick shot to reach the 1. It didn�t take more than 30 seconds for Davenport to make up his mind and get in position for the shot. Applying just a hair of left English, he rifled the cue ball into the far pocket point. 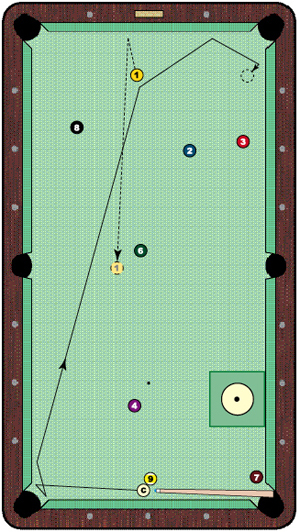 It rebounded to the near point and then to the long rail before it knocked the 1 into an obscured position in the middle of the table. Leaving Hopkins safe with such an unexpected maneuver, Davenport nodded his head emphatically and swaggered back to his chair. Davenport wound up winning the rack and seemed to pick up some momentum, but Hopkins eventually closed out the match, 13-5.